About the Book Have you tasted milk? Do you know where the foods you eat come from? If you guessed a farm you are correct. Farms are exciting places where crops are grown and animals are raised. You can find trucks and tractors, cherries and berries, wheat and oats, kittens and cows, fields and trees and a whole lot more on the farm. Have you visited a farm or lived on one? 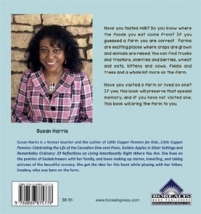 If yes, this book will preserve that special memory, and if you have not visited one, this book will bring the farm to you. Susan is the author of Little Copper Pennies, Little Copper Pennies for Kids and Golden Apples in Silver Settings. Born in Trinidad, she now lives in Melville, Saskatchewan with her husband, daughter, and Smokey the gregarious cat.